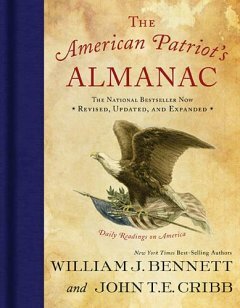 As a history lover, I was excited to review "The American Patriot's Almanac" by William J. Bennett and John T.E. Cribb. I am happy to say it was more than I expected. It's actually set up in a 'devotional style' format, giving bits of American history for each day of the year. Just look up the current date and find out what happened 'on this day in history'. But it's so much more than that. It's a fairly good sized book, very sturdy, and one that would be great for keeping on your coffee table. It has a lot of information yet it's easy to read and not too much to take in all at once. It is definately something my 11-year-old son would not hesitate to pick up. I think the daily format makes it more appealing to young readers. They can learn some interesting history in a short time. I think they will return to it often. It has a lot of useful information included in sections, such as; Flags of the Revolutionary War, The Declaration of Independence, The Bill of Rights, State Flags, Facts, and Symbols, and much more. It's really a great tool. And while it's set up in a daily format, you may just want to read it through like any other book, or even refer back to it often as a reference. Either way, I think you'll enjoy it.